In the fall, the air is crisp, the leaves burn with red and orange as they change, and pumpkins return to grace stoops and porches with grinning intensity. I love pumpkins. A mini pumpkin sits cheerfully on my desk lamp as I type this, a yearly tradition I’ve indulged in for many an October. Ever since I can remember, my family has carved jack o’lanterns. And every year, my mom would take the seeds we scooped out of the huge gourds and roast them with some salt for snacking later on. They’d sit in a pale yellow tub, a relic of a margarine gone by, waiting for my eager little hand to scoop out a handful to accompany my latest book. The first pumpkins of the season have come out and though it’s still too early to carve a jack o’lantern (unless, of course, I don’t mind the neighborhood punks playing soccer with it long before Halloween rolls around), nothing says I can’t roast some pie pumpkins for my own nefarious ideas. Most of the winter squash have large, meaty white seeds that can be used in this simple recipe. You get the best yield out of pumpkins, as far as I’m concerned, but I think I’ve established my bias already. I’ve made roasted seeds from acorn squash, the large melon-tasting pumpkin my mother-in-law grows, and a few others besides pumpkins. The hardest part is separating all those tasty little morsels from the strings and goop that is scooped out with them. I usually try to get the big stuff off then put the seeds and any remaining flesh into a colander. After a bit of swishing around under cold running water, most of the goop is washed away and the big chunks are easy to discard. A good healthy shake to get the excess water off and they’re ready for roasting. In a small bowl, soak seeds in warm salted water for about an hour. Drain and pat excess water off. Toss seeds with oil and 1 to 2 tablespoons of salt (depending on how salty you like them) and spread out on a foil-lined baking sheet. Bake at 350F for 30 – 45 minutes, tossing every 15 minutes, until they begin to brown. Let cool and store in an airtight container. I like to soak my seeds in salted water before roasting. I find it keeps them plumper and adds a more rounded salty taste. Completely optional, however. I have no idea how long they will last. Mine never make it more than a few days before being eaten up. Now, that’s the basic recipe, but what about something with a bit more kick? These little guys make a great beer snack, says my husband, and are fun if you’re tired of just plain salted seeds. 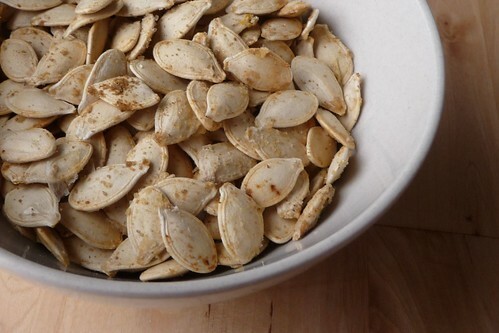 As for Roasted Pumpkin Seeds, brine seeds for an hour if desired. Pat dry and then toss with oil and spices. Spread in a single layer on a foil-lined sheet pan and bake at 350F for 30 – 45 minutes, tossing every 15 minutes, until they begin turning golden. Let cool and store in an air-tight container. This entry was posted in dairy-free, gluten-free, recipes, snack, untranslated, vegan, vegetarian. Bookmark the permalink. i made the ‘spicy’ ones last night. they’re great! thanks for the recipe. Pingback: The Kitchen Mouse » Happy Halloween!